Product prices and availability are accurate as of 2019-03-01 05:30:14 EST and are subject to change. Any price and availability information displayed on http://www.amazon.com/ at the time of purchase will apply to the purchase of this product. 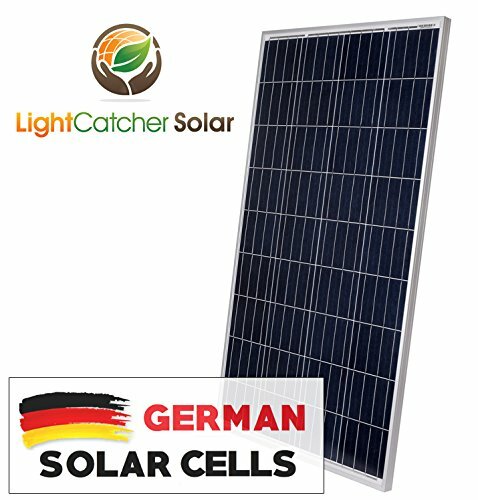 LightCatcher-Solar 100 Watt solar panel utilizing quality German made cells. 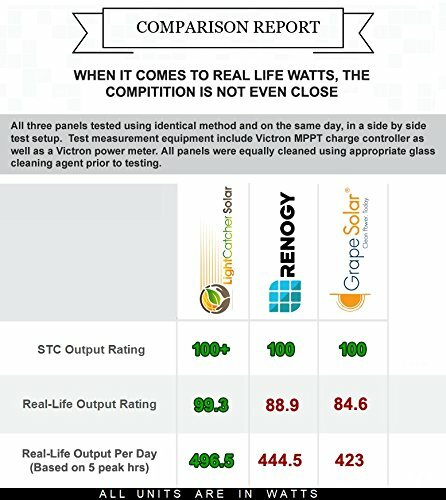 Not all off-grid modules are created equal. We have designed and manufactured our modules for optimal performance in off-grid applications. Since 12 V batteries are commonly used in off-grid systems, LightCatcher-Solar panels are optimized for charging these batteries. 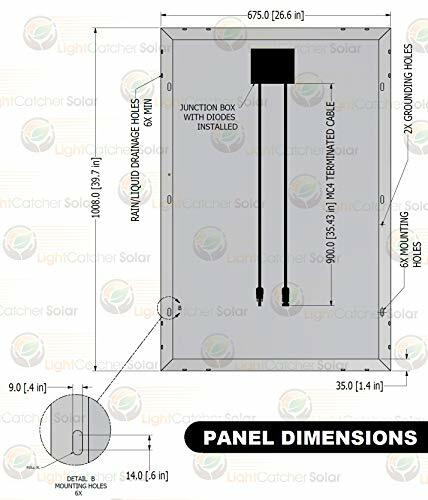 When using batteries with higher voltages such as 24 V or 48 V, 2 or 4 LightCatcher Solar panels can be connected in series to generate the optimum battery charging voltage. Higher power systems can be achieved by connecting strings in parallel to reach the required number of modules. LightCatcher Solar modules are compatible with both Max power point tracking (MPPT) and Pulse Width Modulation (PWM) charge controllers. 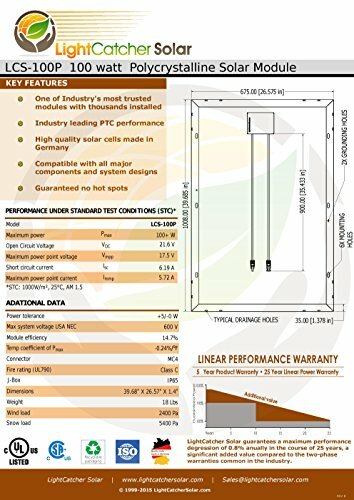 100W polycrystalline solar panel with guaranteed positive output tolerance (-0/+5W), perfect for 12 volt and 24 volt battery charging systems IDEAL DAILY OUTPUT: 500 watts (depending on the availability of sunlight) Grade A solar cells made in Germany to achieve true 100W in a wide range of temperature Easy Installation with pre-drilled hole. 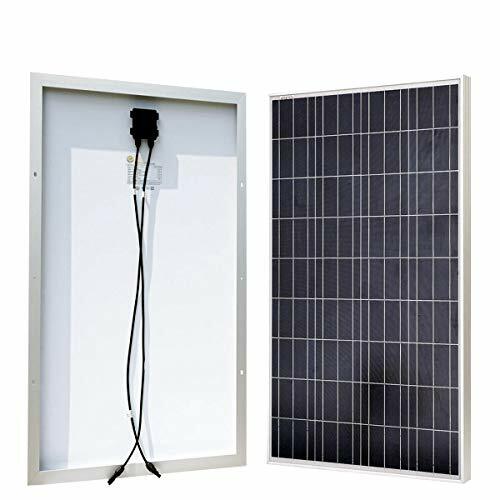 each solar panel comes with 35.5 inches 12 awg cable with MC4 Male/Female quick connectors Corrosion-resistant Anodized aluminum frame, Waterproof IP-65 Rated Junction Box, 5 year warranty on parts/labor, 25 year power warranty.